After a campaign full of drama and tumult, the first round of Jakarta’s gubernational election on 15 February produced a result widely forecast in polls: the incumbent governor, Basuki Tjahaja Purnama (‘Ahok’) topped the tally, former Education Minister and academic, Anies Baswedan, came second, and Agus Harimurti, the son of former president Susilo Bambang Yudhoyono, finished last. The final result will not be announced till 27 February, but most exit polls have similar results: Ahok gained about 43%, Anies 40%, and Agus 17%. As no candidate gained more than 50% of the vote, the top two candidates will contest a second round on 19 April. Much has been made of the election’s significance. Not only is Jakarta Indonesia’s political and economic hub, but the governorship can serve as a stepping stone to the presidency. Joko Widodo (Jokowi) launched his successful campaign to be president after just two years as governor. But it was the overt and unprecedented sectarian and racial overtones to the campaign that made it so controversial. Ahok is a Chinese Christian and thus from a double minority in a metropolis that is 85% Muslim and 93% non-Chinese. Moreover, he is a bluntly spoken, ‘crash or crash through’ politician, who regularly antagonizes important sectors of the electorate with his statements and actions, but who is widely credited with achieving much during his first term. Since soon after Ahok took over as governor from Jokowi in 2014, hardline Islamist groups disputed his suitability to lead the city because he was an ‘infidel’, though their campaigns initially attracted only fringe support. Opinion surveys in 2015 and early 2016 indicated more than two-thirds of Jakartans approved of how he was running the city and the governor seemed set for an easy victory in the next election. All this changed on 27 September 2016 when Ahok gave a campaign speech in which he urged voters not to be misled by those who claimed that the Qu’ran prohibited a non-Muslim from leading a Muslim community. He was immediately accused of insulting Islam and Islamic scholars, and the National Ulema Council declared him a blasphemer. This led to two massive rallies in Jakarta attended by hundreds of thousands of Muslims demanding that police charge and detain Ahok for blasphemy. Under immense political pressure, police charged Ahok in late November and since mid-December, he has been on trial. A verdict is not expected till March or April. Ahok’s public standing plummeted after the blasphemy controversy. Surveys showed his electability tumbling from 50-55% in June 2016 to around 25% in November. More than 60% of respondents in late 2016 believed the speech was blasphemous, and many Muslim voters shifted their support to Anies or Agus, even if they believed Ahok had managed the city well. At this stage, Ahok’s chances of re-election were fading and many commentators feared that political pluralism in Indonesia was also under grave threat. Surprisingly, it was the court case, which his enemies had hoped would ruin him politically, that set the scene for his revival. Ahok, atypically, was humble and contrite in his appearances and much was made of his close ties to his Muslim foster family. The case against him also ran into problems, particularly with questions about the credibility of important witnesses. Significantly, as greater detail emerged about the speech and more voters viewed footage of it, fewer deemed that Ahok had blasphemed. He was buoyed by strong performances in the televised debates. By early 2017, polls had Ahok back in the lead. Ultimately, it was Ahok’s record for clean, decisive and reformist governance which saw him rise again in the polls and eventually win the most votes. 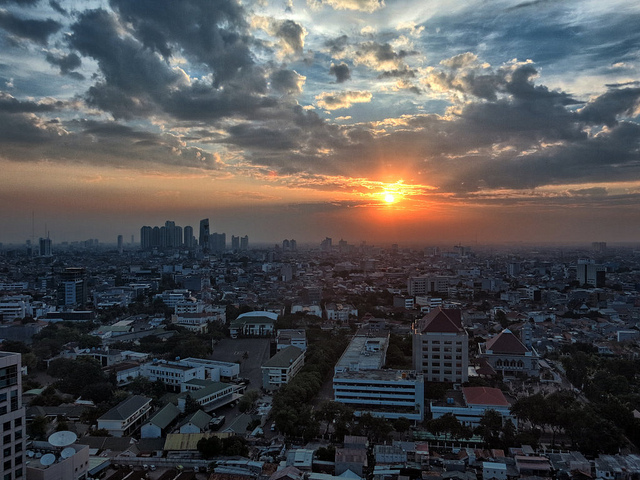 Despite his abrasive manner and sometimes harsh policies towards slum dwellers and petty traders, most Jakartans were convinced that life in the city had improved under his leadership. Also crucial was his success at partially neutralising the blasphemy issue. Ahok’s penitent attitude and the discrediting of some of his accusers helped to shift voter attention away from emotive religious issues towards his policies and achievements. Indeed, surveys in February 2017 revealed that religion was a determining factor for only about 8-10% of voters. The widespread religious and ethnic denigration of Ahok in late 2016 was a low point for civility in Indonesia’s democratisation, but the 15 February results suggest the longer-term impact may be less pronounced than many feared. Ahok and Indonesian pluralism face two further tests in coming months: the outcome of his trial; and the second round of gubernatorial campaigning. If Ahok is found not guilty, or is convicted but not jailed, Islamist groups will mobilise again and anti-minority feeling will once more be aroused, though perhaps not with the intensity of late 2016. The next round of the gubernatorial race will pit Ahok against Anies and much depends on which candidate draws the majority of Agus’ largely Muslim voter base. Ethnicity and religion are again likely to play a role. Anies, though seen as a moderate, has courted hardline Islamic groups and used Islamic appeals against Ahok. Over the past decade, voters have tended to be persuaded by competence rather than primordial or religious appeals. If an election as significant as Jakarta’s is decided on Islamic sentiment, then political diversity will be dealt a serious blow. Greg Fealy is associate professor of Indonesian politics in the Department of Political and Social Change at The Australian National University. Image courtesy of Flickr user mazuu.